TRÀ VINH — Local farmers in the Mekong Delta Trà Vinh Province have turned challenges, triggered by climate change, into opportunities to earn money. 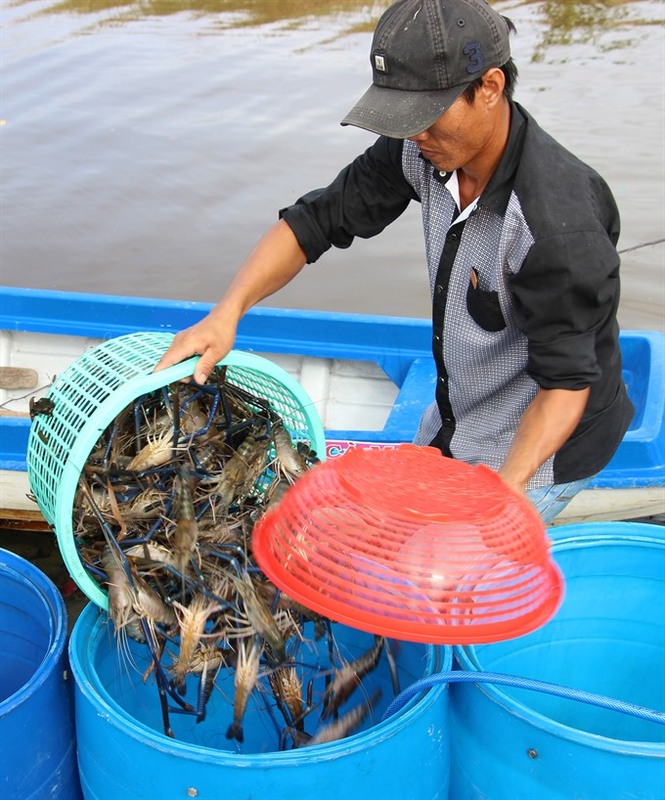 Nguyễn Văn Danh, of Trà Vinh Province’s Long Hòa Island Commune, said he started to raise blue-legged prawn instead of planting rice for three years. He and six children now own a 7-ha shrimp farm, earning a profit of hundred millions of đồng each year, the Tiền Phong (Vanguard) online newspaper reported. “By growing rice, we always worried how to earn money to cover daily expenses in the past, by farming blue-legged prawn, we now only focus on making more money to become richer,” he said. Danh said, a decade ago, local farmers only cultivated rice during six months, the rest six months of a year; they planted nothing because salinity attacked their fields. Thus, local farmers at that time were very poor and had to go to other provinces to earn their living during the salinity season. “Now things are changed,” Danh added. The changes actually came when Đặng Văn Chuột, 78, of the commune, bought 2,000 baby blue-legged prawns to breed nearly ten years ago. The baby blue-legged prawns with scientific name as Macrobrachium rosenbergii, were worth about a mace of gold at that time. (Currently, a mace of gold worth VNĐ3.6 million, or US$158). Then he persuaded his wife to spend their savings on breeding blue-legged prawn. At first, she rejected because she feared that if they failed, the savings would disappear. Chuột tried to persuade her many times and she finally agreed. Five months later, they harvested the first blue-legged prawns and gained a profit about 25 times higher than the money they invested. Chairman of the People’s Committee of the island commune Huỳnh Quốc Vũ said that thanks to the successful model of Chuột, dozens farmers of the commune raised blue-legged prawns and succeeded. In Hòa Minh Commune, Võ Thị Chanh, of Cồn Chim Village, owned a 1-ha field. She both planted rice and raised blue-legged prawn. During the fresh water season, she grew rice. When salinity came, she raised blue-legged prawn. She got a profit of VNĐ200 million (US$8,800) each year. Chanh said she harvested about three tonnes of rice each year. Her family would eat two tonnes of rice, one tonne would be used to raise blue-legged prawn. She pureed rice mixed with acetes (baby shrimp) to feed blue-legged prawn. Nguyễn Văn Sĩ, chairman of the People’s Committee of the commune said the income of local farmers was improved in recent several years. The ratio of poverty household has been down below 4 per cent, meeting the criteria for a new-style rural area under the Government decision 1980/QĐ-Ttg issued in 2016. The Mekong Delta, home to more than 17 million people and the Việt Nam’s most important agricultural region, is facing threats due to climate change. Last year, a severe drought and salinity invasion in the southern delta gave the national agriculture sector a wake-up call on climate change’s threat to the region. The record extreme weather affected 13 provinces in the region, causing water shortages for millions of people and caused the loss of some 800,000 tonnes of rice. Additionally, the sediment in the Mekong River which constantly brings down to the delta and is vital for rice growing capability, has decreased at a remarkably fast speed over a short time. Statistics from the Mekong River Commission show that the river delivered up to 160 million tonnes of sediment to the delta in 1994, which was slashed by half to only about 75 million tonnes in 2014.